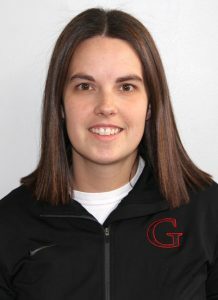 WINONA LAKE – Jenna Carter has announced her resignation as the head coach of Grace College’s cheerleading team. Carter cited a desire to focus more on her family as a primary reason to step down from coaching the Lancers. The announcement was made surrounding Grace’s cheerleading banquet Tuesday evening. The cheer squad just finished up its winter season supporting the Grace College men’s and women’s basketball programs and their inclusion in the NCCAA National Basketball Championships held on Grace’s campus. Carter served as Grace’s cheer coach from 2009-12 and then again from 2016 through the end of the current basketball season last week. “Jenna has done a fantastic job leading the cheer program at Grace College. She has always set a high standard for Christian excellence, and it has shown in her teams each year,” said Grace Director of Athletics Chad Briscoe. “We wish her all the best as she transitions and appreciate greatly all she has done to impact lives through cheer at Grace. A search for the next cheerleading coach will begin immediately for the Lancers.